The Kentucky State Fair will be here before we know it. Many beekeepers are having a good year due to the relatively mild winter. July 1 is the deadline to enter categories, and you can submit your categories online at Kentuckystatefair.org. 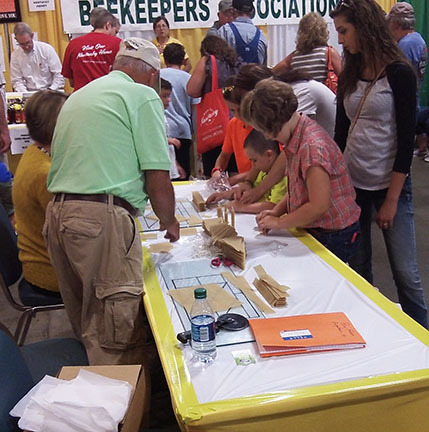 Local bee association presidents and Extension agents may deliver Kentucky State Fair entries as long as the entries have the appropriate tags and arrive before 6 p.m. Monday, Aug. 14. Ginny Mitchell of Iowa State University will return to Kentucky to judge the Bees and Honey Cookery competition. Bud Spath will be the 2017 assistant superintendent. Honey Cookery judge Jill True will again oversee the culinary competition. This year’s KSBA President is Rick Sutton, no stranger to honey competitions. Rick just judged the 2017 American Beekeeping Federation Honey Show. He will be coordinating the KSBA Honey Booth. Some rule changes to be aware of this year: In all adult or youth classes, items submitted must not have any reference to the exhibitor. This rule change may apply to Honey Cookery more than other classes, but the effort is to provide impartial judging. Any items so identified will be disqualified and will be on display only after judging is completed. Beth Wagner of the Kentuckiana Beekeepers Association entered an observation hive last year, which, for me, was a real highlight of the State Fair competition. I would like to see more observation hives entered if possible. We have the ventilated cases, and observation hives may be picked up after judging to allow bees to fly. There is a new category called Photograph (General Beekeeping). The photos need to be taken by the exhibitor this year (2017). Here are the criteria: Maximum size 8×10 inches, unframed but matted with a maximum two-inch border. Subject must be honey or beekeeping and may depict harvesting, processing, marketing, or packaging bee hive products. Artistic Beeswax was a success last year, so that category is back. There is a new category for Youth: Beeswax candles (molded, various shapes, rolled). Entries are to showcase the natural beauty of beeswax. No added color is allowed. 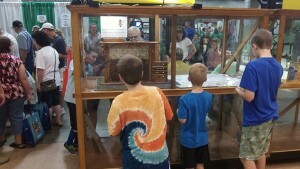 There are both 4-H and Open youth categories for products in the Bees and Honey competition. In terms of honey cookery, Honey Nut Bread is back as a category. Cornbread has been added as a new category. Honey-Based Granola is its own category, as is Nut-Based Snack. Just a reminder to those wonderful cooks who spend so much time on the entries: Please do not use identifiers such as uniquely-colored ink on the exhibit tags. Also please use non-identifiable plates. The judges want to be as impartial as possible. We also request that if you enter a pie, that you clearly state how the pie crust incorporates honey (brushed decoration is just fine). We ask that all honey cookery products be turned in with recipes.